Workplace expert, author, speaker and humorist, with hilarious, interactive, and inspiring programs on teamwork, leading change, success, innovation, communication, and transformational leadership. Joel Zeff creates energy. His spontaneous humor and vital messages have thrilled audiences for years. As a national workplace expert, speaker, author and humorist, Joel captivates audiences with a unique blend of hilarious improvisational comedy and essential ideas on work and life. He has shared his experience and insight on collaboration, innovation, communication, work/life balance, leadership, teamwork, passion, and fun with more than 1,500 companies and organizations. 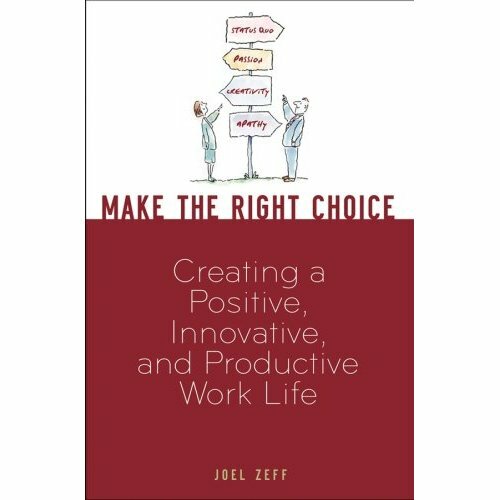 His book, Make the Right Choice: Creating a Positive, Innovative, and Productive Work Life is consistently listed as one of the top work/life balance books on Amazon. He has appeared on CNBC’s The Big Idea with Donny Deutsch, the Fox Network’s Fox and Friends Weekend and been featured in the Dallas Morning News, Houston Chronicle, The Kansas City Star, and many other media outlets. We’ve all witnessed the excitement of a three-year-old child. They celebrate finding a ladybug. They celebrate drawing a flower. They celebrate going to the bathroom in the toilet for the first time. Somewhere along the way, too many adults lose this sense of excitement about our lives and our work. Our tanks are empty. There is no fuel for collaboration, productivity and innovation. When employees and managers are not having fun and enjoying their work, they become “Bye-Bye” people. “Bye-Bye” people don’t care about taking care of the customer, meeting goals, producing results, or having fun. Employees and managers who have fun at their jobs are more loyal, enthusiastic and passionate. They sell more, communicate more effectively, take better care of customers and produce more sustainable results. And fun increases employee retention. In Joel’s dynamic and motivational keynote presentation, employees will appreciate the value of fun in the workplace and learn how to make the simple choices to have more fun, and increase their passion and success. Learn to celebrate work and create a positive environment. Learn to improve teamwork and help all partners find success. Learn the three keys to leading change: be prepared; be focused; be open and flexible. Learn the key to success: staying in the game and keeping your passion. Learn to promote ownership and accountability. Learn to encourage innovation by creating opportunity. In Make the Right Choice, Joel shares his experience and insight on creativity, communication, teamwork, passion, and fun. With wit, a sharp observational eye, and playful irreverence, he discusses the choices we all encounter in our careers. We each have the ability to take initiative and make the right choice to live a more creative, passionate, effective, and productive life. How do your employees and managers Make the Right Choice? We all must take ownership of our work environment and create a foundation of opportunity and positive support. We can choose to be patient, supportive, and more flexible to change. We can choose to have fun in the workplace and still be productive. Joel teaches us just how easy it is to make these choices. He connects to his audience with humor that has them laughing so uncontrollably that their mascara runs, their cheeks hurt, and their bellies ache. And he doesn’t do it alone. Volunteers from the audience join him on stage and play an integral role in an improvisation game in front of hundreds or thousands of people—something the audience members have never done. He expects nothing less than their success. He expects the volunteers to focus and work together as a team; communicate effectively; positively support each other; and take responsibility. Joel makes his audience laugh so hard that they forget about the corporate nonsense of conference calls, “strategic deliverables,” PowerPoint presentations with upside-down triangles, or “paradigm shifts in a cross-functional organization.” Make the Right Choice is conversational, funny, and very informative. Yes, Joel will make you laugh, but he’ll also make you think. This presentation delivers a combination of inspiration, essential business knowledge, and significant ideas to help audience members reconnect with their own passion, creativity, and success. It’s hard to have fun and stay passionate at work during stressful times. Your employees build stress after each media report about economic challenges. Business today means surviving and thriving during a merger, layoff or the all encompassing “restructuring.” How do managers continue to motivate and energize employees during difficult times? Managers must help employees stay in the game; work in the moment; and take ownership of their happiness. Joel leads the audience through a series of exercises that demonstrates how easy it is to continue working creatively, effectively and productively while dealing with change. This interactive and hilarious presentation will teach managers the importance of creating opportunity and giving positive support to their employees. Just as important, managers must allow employees to create ownership. Ownership and responsibility will allow the employee to care. And once the employee starts to care, the next step is passion. Joel uses humor and improvisation to teach his audiences how important these simple choices are to success. During this keynote, audience members will laugh, have fun and be motivated, inspired and energized. It’s hard to explain, but we all know what happens when a partnership or group has chemistry: it’s important in any relationship. When co-workers have fun together, they communicate better and connect on a deeper level. And when they connect, this creates trust, which enables individuals to take greater risks with the knowledge that they have their team behind them. In order for a company to innovate, it must manage risk well, and it can only do so through the prerequisite communication and teamwork. Joel’s interactive exercises train audience members to enjoy their work so they communicate better and ultimately, take more risks. Change happens. We can either be open and flexible to it or let it steamroll us. Too many of our daily problems are not worth getting worked up about, but we react to these small events, and it impacts us negatively. We don’t always have control over our changing circumstances, but we do control our reactions. There’s only one reaction that’s not acceptable: quitting. You can’t quit. You may have to communicate your needs; you may have to try something new. But you can’t give up. Joel’s presentation reinforces this message through his dynamic interactive skits. A leader has to innovate (by tolerating risk and solving problems). A leader needs to know how to prepare for change (by controlling his or her reaction and never quitting). And a leader must communicate well (by creating a 50/50 communication partnership, giving details when necessary, and maintaining a positive and patient attitude). But first and foremost, a leader must set an example by having fun and enjoying one’s own work so that others can do the same. Joel’s interactive presentation will highlight this important lesson through concrete tips and tools. Not just an emcee, but a KEYNOTE EMCEE. Joel is a sought after host and emcee for general sessions, awards night presentations, and other corporate events. Joel brings the same unique and powerful blend of humor, energy and business knowledge from his keynote presentations to his emcee clients. Joel has presented at more than 1,500 events. Hundreds of clients have hired Joel to emcee their general session or awards program. He has also worked as a television host and commercial spokesperson. Add a couple of thousand comedy nightclub performances, and you can see why clients love Joel as their emcee. Think of Joel as a Keynote Emcee. As an emcee, Joel uses his message, humor, and improvisation exercises (you can view those in the speaker demo) as mini-keynotes. Think of it as splitting up a powerful keynote into small modules spread out during the event. Some of the modules can be short (5 minutes) or a little longer (10 minutes). Each module can include a short business message, but nothing too extensive. Don’t have time for the interactive games? Joel can act as a traditional emcee using his humor, wit and strong business knowledge to energize any corporate event with fun and laughter. Joel brings a different perspective on the emcee experience. Using his messages and improvisation exercises, Joel delivers more in the same amount of time. Joel knows the emcee can engage, entertain, motivate, inspire and deliver powerful messages. So, the ROI increases tremendously. Yes, Joel can do all of the typical emcee duties. And frankly, that is quite easy. Joel brings more. The ability to add message, engage the audience with interactive experiences, and partner with the client to create a memorable event. Everything Joel does is based on his foundation tools of humor and improvisation. Joel believes in the power of fun. To Joel, the improvisation games are the perfect form of comedic entertainment for a corporate environment. Comedy is a shared experience. Joel does not rely on stand-up comedy bits that may or may not work. The improvisation games are successful 100% of the time because the humor is based on three levels: the uniqueness of the game; watching your peers play the game; and Joel’s ability and interaction with the audience and volunteers. For awards presentations, there are two goals: recognize and reward the award recipients and entertain/motivate the rest of the audience. During award programs, Joel’s humor comes from the moment, audience, surroundings, and everything that is happening. Joel customizes each emcee award experience with the client. Some clients ask Joel to emcee the entire event. Others want Joel to share duties with the CEO or other executive. Joel works with clients to determine how best to use his skills. Joel’s job is to do the heavy lifting and create a fun, energetic and memorable awards evening. Joel connects to every audience. He understands how to set the tone for a memorable awards program or general session. He has a passion for business and the shared experience of fun. Simply put, Joel will help you create a memorable and powerful event. Joel uses a unique blend of improvisational and traditional comedy for his event entertainment. His comedy is hilarious, interactive and perfect for any corporate audience. The same dynamic energy and audience interaction that make his keynotes so engaging, works perfectly as pure entertainment. Joel can also customize his entertainment performances to include key managers and audience members. His entertainment is perfect for after-dinner, entertaining employees and spicing up conferences. Want to add more power to the entertainment? Joel can include some of his key messages to the performance. Are you ready for the next level of corporate event entertainment? How about music? Check. We have an accomplished piano player who opened a comedy show on the Las Vegas strip. How about talented comedic performers? Check. The show involves four performers (including one musical director on piano) with extensive commercial, television and film credits. How about costumes and props? Check. Oh, we can bring funny wigs. The show involves customized improvisational skits, music, audience interaction, costumes and video. The cast includes some of the best improvisers and comedians in the business. The show is original, interactive, hilarious and customized for any corporate audience. The material comes from the audience, organization, event, theme, and location. That information is used as the material for the improvisational sketches and songs. The piano player accompanies the group. The audience gets involved in some of the skits that happen on stage and in the audience. It is clean, fun, hilarious, customized and perfect for any corporate or association event.